The British Chamber of Commerce in Lithuania is a non-government, independent membership driven organisation promoting international trade, growth and business opportunities. Open to British, Lithuanian and international companies, the chamber's trusted network is ready to help by introducing, referring, advising and providing a trusted platform for effective business networking. Members represent a variety of business sectors with financial services being one of the most significant. The chamber's professional viewpoint is well respected in the Lithuanian business market and members are frequently requested to give opinions in the media on UK and Lithuanian business issues. Access to the Lithuanian Government and public institutions helps the chamber to facilitate a constructive dialogue on matters relating to improving the business environment in Lithuania. More information is available at www.bccl.lt. 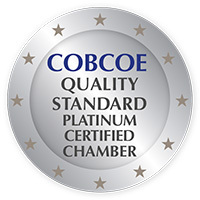 BCCL is a COBCOE Quality Standard (Platinum level) certified chamber.